sailboat. 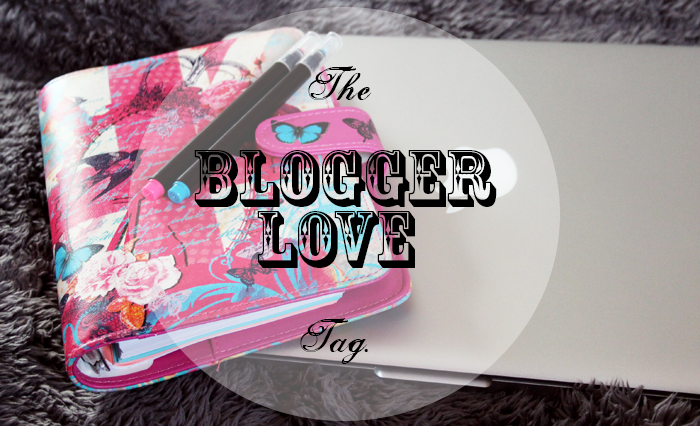 : Blogger Love Tag! Fee from Make Up Savvy created this truly lovely tag, and I've been looking forward to having half an hour to sit down and think about my answers. It's so important to share the love in the blogging community, it's such a supportive place and I'm honestly not sure where I'd be without this little space as my outlet. I stumbled across the beauty community over on YouTube first, specifically a review on the Lily Lolo mineral foundation by Peachy Keen Cheeks. I don't think Victoria blogs or makes YouTube videos anymore but she opened the door to the bloggersphere for me and I'll be forever thankful. Rockstar Diaries/Love Taza was definitely one of the first blogs I remember finding and it's one I still read to this day. Wander to Wonder is an incredible lifestyle blog and Miho is one the loveliest ladies I've had the pleasure of 'meeting' in all my twenty four years! I always look forward to a new post from Rachel over at Blush & Brunch popping up in my subscriptions because she has a way with words that makes me feel like I'm catching up with an old friend who I've known forever! And Vicki from Let's Talk Beauty is completely wonderful and her space is the best place to spend a few minutes with a cup of tea. Okay, so I don't really know how to answer this question because, well... I'm not a very good friend! I'm not the best at opening up and having those conversations that friends have, I don't think. But talking about silly things I can totally do, so there are quite a few lovely ladies I absolutely think of as friends but they probably just think of me as someone they have a quick chat with every few months. Essentially what I'm saying here is I don't know what constitutes as a blogging friendship because I'm rubbish and awkward! There was one person that came to mind instantly though and that's Carly from Carly Watts Illustration. At times I'm fairly sure that we're the same person, but really she's way cooler than I am and infinitely more talented! She constantly inspires me to work harder and think bigger. She's lovely, so incredibly supportive and I'm so pleased the bloggersphere has allowed us to 'meet'. I think Emma from Girl With Makeup and I have pretty similar taste when it comes to make up products. Whenever I click over to read her latest post I almost always leave with at least one more product on my little 'products I really want to try' list! I've been trying to avoid all mentions of the Revlon Lacquer Balms but I've just seen that she has one and it'll only be a matter of time before I'm skipping merrily into Boots to purchase one for myself! Five blogs everyone should be reading? There are way more than five that I could list here, but the first that came to mind that I haven't already mentioned in a previous question are.. The Beauty Milk - Coco is stunning and she has such a talent for make up. I always trust her opinion. Sleep and Water - every single review is so considered, written beautifully with stunning photographs. Josie's Journal - she's so inspiring without even realising. You'll adore her, I just know it. Blogger's Bookshelf - if you love books, the community they've built up over there is the place to be! Sunny Sweet Pea - Jenny is lovely and her sweet lifestyle blog is an utterly perfect reflection of her! What is your favourite way to read blogs? Even though I wasn't sure at first, I've grown to really love bloglovin'. I like having a place to safely store all my favourite reads alongside ones I've recently discovered that I'm just getting to know. I also like to explore the popular sections although they're not as diverse as they used to be before the redesign. Anyone and everyone that has made their space truly their own and is writing about things they're passionate about. When you really love something there's something extra that shines through and that's something that just isn't there if there's no passion. Annabel from Fragmented Splendour is passionate about natural & organic skincare & beauty products. She constantly inspires me to make more considered choices when it comes to products I'm using regularly and I often find myself searching through her posts for recommendations. Char from t*rexes and tiaras inspires me because she's an amazing lady, who genuinely doesn't see how amazing she really is. And I wish she did. She does so much, not only for herself but for others too. In fact she probably gets more things done every day than I do in an entire week, I don't know how she squeezes it all in! She's thoughtful, with a beautiful soul. And she makes some of her own clothes. And she loves shoes. She's a special lady. Laila from Tape Parade inspires me by just being herself! She shares aspects of her incredible life, I love seeing little snippets of her days and I always leave her blog with the need to get stuck into something creative! She's an incredibly talented musician who has worked hard to get where she is, I have no doubt that she's going to be super duper successful and she really deserves the whole world. I love designs that reflect the personality of the blogger. Whether that's something very monochrome & simple or bright pink & super girly, I don't mind as long as it fits and it's nothing too overwhelming that it takes away from the content. I adore A Little Boat Sailing because everything is beautifully laid out and it's simple but full of personality at the same time. Amy is also an absolute darling and deserves all the success in the world! There really are so many things. The bloggersphere is an endless source of inspiration and the fact that it brings so much happiness to so many is nothing short of amazing and beautiful. For me having somewhere I feel safe, where I can be myself, write about whatever is going on in my head at the time and feel supported & like this is somewhere I really belong is something I never imagined would have happened way back when I nervously wrote my first post. It's brought me confidence within myself and my writing. It's taught me to always be positive and to always look for the good things. Again, SO many! But I think my number one would be Nicola from Our Little Balham Life because she's a wise one that Nicola. I'm convinced that she has a lot of useful advice, knowledge and anecdotes stored inside her and she would be able to share them in such a relateable way. I'd buy her book for sure! I tag you - I'd love to read about your favourite reads and the blogs that inspire you! Jennie <3 Thank you, that is all I can say. I'm having a tough time at the moment with various things, feeling like I'm not good enough etc so reading little things like this when I least expect it really makes me feel a bit more positive. I'm the same with friends, I really struggle and as much as I would like a best friend I just can't seem to open up properly, I always feel pretty awkward etc which is why I feel quite 'lonely' at the moment I guess. Gosh this turned into a self help session haha! Aw you lovely lady you. Thank you so much. I've loved your blog since I discovered your sweet videos on you tube. This tag is brilliant I will definitely be doing this one. I am honoured to be mentioned in your Blogger Love Tag - amongst some of my favourite blogs too! You have to make sure when you read my blog with your tea you have a nice biscuit too! Loving this post, found some amazing new blogs on one of my favourite blogs - yours! In all seriousness though if I done this post (might do actually) your blog would be up there, it was a big inspiration to me in starting my own. I remember back in uni writing my dissertation and reading your blog on my breaks and loving it so much and so badly wanting to start my own as a result. And I did! Ohhhh Jennie, you lovely lady. I felt the same way about Bloglovin'! Then there was that scare with Google reader shutting down and I completely switched, hehe. Interesting read, Jennie. Thanks for the blog recommendations! this tag is fun! Will do this one too. Ooh this was a fun read, lots of good recommendations to check out! Although it can be so difficult to whittle down which blogs I'd pick as favourites, you're right - there are just too many good ones! Will be checking out the lovely blogs you have recommended for sure! This was a good read! I'm way too new to the community to be able to really contribute but I will be looking at some of your recommendations! This was so much fun to read. I will be looking at your blog reccomendations. So lovely to see you did the tag :) pefect person to do it as you always share the love.